August 30th, 2015 , under Haxe. This blogpost is about making bitwise operations in Haxe more easy. If you like doing micro optimization in your code, you probably want to use bitwise operations. 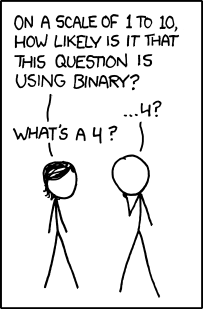 But I found the main problem about bitwise operations is that they are hard to read. If you know the syntax and know what it does it might be “doable”, but if you work in a team it might get harder if not everyone is familiar with the syntax. A common example of using bitwise operators is to put multiple states into one integer. Some call them flags. But if you want to optimize it, you could also put all those values into an variable. Computers deal with ones and zeros right? In this case we create a string with zeros and ones. We could say that the last value means “can view” and the one next to it “can access” etc.. In our case only the last digit is “1” so that means it is on (true). the others are “0” so they are false. For those who can count binary, 000011 in real value equals 3. By the way, the leading zero’s don’t mean anything. Play with this live-example to see how you can blend different flags. To go back on how we declared the Access class, I think it can be improved. It now has that count that is slightly annoying since it doesn’t feel natural. Let’s look at this table. As you notice in the last column, the same values can be achieved with a left shift <<. So “000001” equals “1” but is the same when we write it like “1 << 0”. Personally I think its more readable to have this last column in your code because it just increases normally, what do you think? Let’s use the power of Haxe to simplify the Access class. Instead of using static vars, let’s create an enum abstract. No wait, let’s also use the left shift so we don’t have to count those 1,2,4,8 etc..
Ah, in my opinion everybody can maintain this. Even if you don’t understand what’s happening. Since we use the ‘inline’ there is no actual function call in the output. You can see in this live-example how the generated output looks like. Neat! Now, that’s it for the Access class. We created an actual type! public var rights:Access; // isn’t this nice!? But it still translates and works as an integer. 😯 Aiiii, there goes the readability isn’t it? Well lets create a utility class that contains a remove function. I use this BitSets class from Flambe, which has some other nice functions too (like testing if a integer contains a flag). But let take it one more step further, and use the Haxe static extensions feature. The key to use it is by adding the keyword ‘using’ instead of ‘import’ on top of your class. It doesn’t get cleaner than that. Check out this full live-example to see how it all comes together and what the effect is on the generated output. We saved ourselves from multiple booleans on a user class, we’ve learned how to use flags. We made a enum abstract type called Access for our user.rights property. Working with bitwise operators can be readable. This BitSets class is very nice to have. The functions created to make this readability happen does not affect the output thanks to inlining. You can use this technique for quite some classes. I think when you see classes with multiple booleans, you could consider using flags. Actually, it CAN get even cleaner if you specify your utility methods right in the Access abstract, so you don’t even need static extension. Thanks nadako, those are great additions! there is a tiny problem, bit masks are limited by the underlying Int storage, in this case, that would be until 2^31, or 2^63. or if uint, one more. Another way to do it is to use a Set (a unique list) and just add/remove those enum values. The value of that is that the code is clear, and since this is not compiled to run on a lowly calculator, but on an actual computer, the speed is mighty enough. very nice and educating post, thank you!